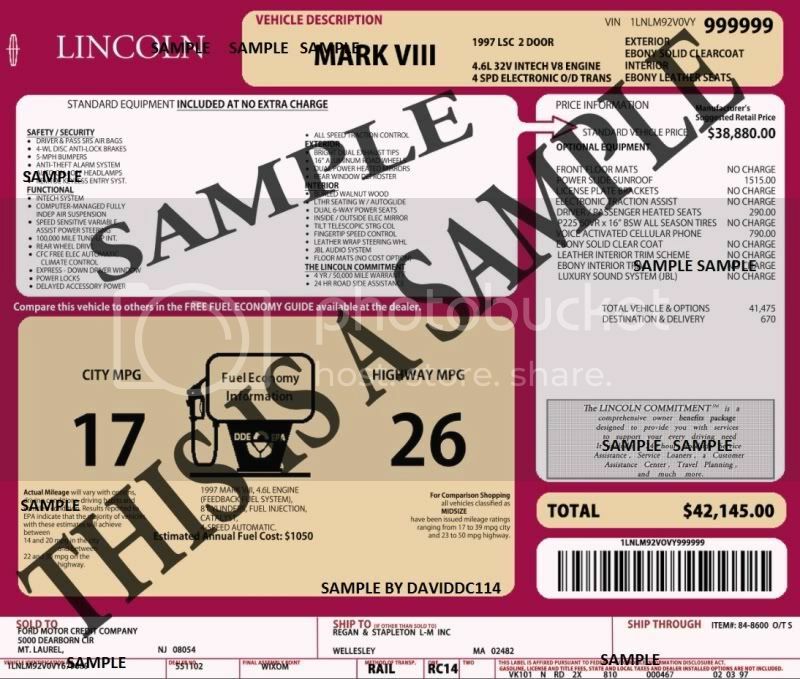 exact replica lincoln mark viii window stickers! dont go to a show without one! dont you hate not having your window sticker? even if you have your original, wouldnt it be nice to have a mint one for the window, and keep yours put away safe. or maybe your original is a little worn and you would like a mint copy, eaither way these are great to have! VIN barcodes do work! there are not the sticky paper like the original window sticker, they are just regular paper, but there is an option to get a laminated one, whch is perfect, put it on for a show, rip it off and throw it in the trunk for storage! all we will need is your build sheet to accuratly build your window sticker! (or if this is replaceing yours, a copy of your original) these are available by contacting fords customer relations department. or ask us about getting this for you. call now!! call now to order yours today! here is a sample of what you will get, your copy is crystal clear, the bar code will be a real bar code of your VIN, you wont tell the difference between this reproduction or the original! 1997 Black on Black LSC with 30K original!! Still Sittin On Factory Michelins baby!! !